Please note: Most of this content was first presented in my blog as I learned more about the place I am bound. But as it's important information, I decided to create a separate section on the website for it. 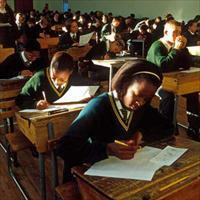 Under the South African Schools Act of 1996, education is compulsory for all South Africans from age 7 (grade 1) to age 15, or the completion of grade 9. While many of South Africa's universities are world-class academic institutions, for many students the road to higher education isn't a given in the same way it is for so many of our students. On August 9, 1956 women stood up en masse to protest against the proposed amendments to the Urban Areas Act (known as the Pass Laws) of 1950. 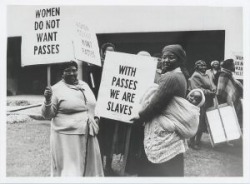 Pass Laws required woman of African decent to carry a pass to prove that they were allowed to enter a "white area" during the Apartheid regime. The full transcript of the petition can be read here. It's not very long, but it's very powerful. The march was a resounding success. August 9th pays tribute to the bravery of these women who risked arrest, detention and banning to gain their liberty. More information can be found at South Africa Explored, and on their Blog. The word 'Ubuntu' originates from one of the Bantu dialects of Africa, and is pronounced as uu-Boon-too. It is a traditional African philosophy that offers us an understanding of ourselves in relation with the world. According to Ubuntu, there exists a common bond between us all and it is through this bond, through our interaction with our fellow human beings, that we discover our own human qualities. Or as the Zulus would say, "Umuntu Ngumuntu Ngabantu", which means that a person is a person through other persons. We affirm our humanity when we acknowledge that of others. "It is the essence of being human. It speaks of the fact that my humanity is caught up and is inextricably bound up in yours. I am human because I belong. It speaks about wholeness, it speaks about compassion. A person with Ubuntu is welcoming, hospitable, warm and generous, willing to share. Such people are open and available to others, willing to be vulnerable, affirming of others, do not feel threatened that others are able and good, for they have a proper self-assurance that comes from knowing that they belong in a greater whole. They know that they are diminished when others are humiliated, diminished when others are oppressed, diminished when others are treated as if they were less than who they are. The quality of Ubuntu gives people resilience, enabling them to survive and emerge still human despite all efforts to dehumanize them." For many Africans, while they may belong to different societies and have different traditions and rituals, Ubuntu usually has a strong religious meaning. In general, the African belief is that your ancestors continue to exist amongst the living in the form of spirits and they are your link to the Divine Spirit. If you are in distress or need, you approach your ancestors' spirits and it is they who will intercede on your behalf with God. Therefore it is important to not only venerate your ancestors, but to, eventually, yourself become an ancestor worthy of veneration. For this, you agree to respect your community's rules, you undergo initiation to establish formal ties with both the current community members and those that have passed on, and you ensure harmony by adhering to the Ubuntu principles in the course of your life. Since the downfall of Apartheid in South Africa, Ubuntu is often mentioned in the political context to bring about a stronger sense of unity. "The passage of the White Paper for Social Welfare through the National Assembly signals the start of a new era in welfare delivery in South Africa. For the first time in our country's history delivery in the welfare field will be driven by key principles such as democracy, partnership, ubuntu, equity, and inter-sectoral collaboration, among others." "The principle of caring for each other’s well-being will be promoted, and a spirit of mutual support fostered. Each individual’s humanity is ideally expressed through his or her relationship with others and theirs in turn through a recognition of the individual’s humanity. Ubuntu means that people are people through other people. It also acknowledges both the rights and the responsibilities of every citizen in promoting individual and societal well-being." It is not perfect, however. Ubuntu – which stresses on allowing every individual to have their equal say in any discussion and on ultimately reaching an agreement acceptable to all – could lead to conformist behavior in order to achieve solidarity. It seems a trifle ironic that Group Politics and the Herd Mentality – the human qualities common to us all, in fact - could derail the quest for the common goal. Still, as they say, the good points outweigh the shortcomings. Given the vast racial, cultural, religious, educational, and socio-economic differences apparent not just in South-African society but the world over currently, the concept of Ubuntu is really rather relevant. It is far too easy to go into the 'us and them' mode. It is far too easy to fall into the trap of judging a different people by our standards or by sticking to certain established stereotypical notions. If you instead regard someone as a fellow human being, all individual quirks and differences taken into account, there is perhaps a greater chance of achieving understanding. And, achieving understanding is important and necessary, because, like it or not, we are all interconnected. What hurts you could one day come around and hurt me. What benefits me, if I'm not too selfish about it, could make a crucial difference in your life. And knowing you could bring a world of meaning and interest in mine.